Good news ! The health community is increasingly committed to progressing towards Universal Health Coverage and well-being for all. This pledge is even more important with the Sustainable Development Goals and related health targets. In particular, these SDGs drive countries to progress towards Universal Health Coverage (UHC). In short, to leave no one behind. That is what we mean by UHC. 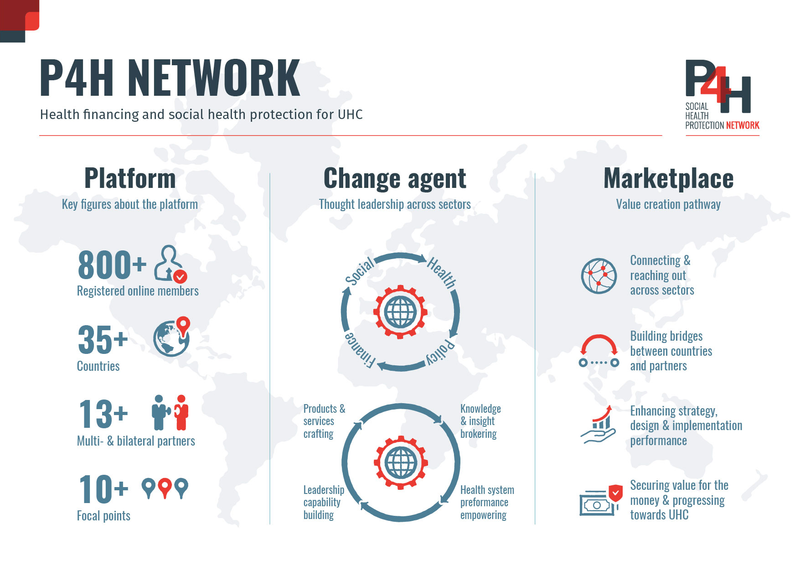 We are the thriving global network for health financing and social health protection. We have a unique presence in health, social protection and public finance and are the change agent behind better co-ordination for global and local partners. A growth driver. A thought leader. A change agent. We support transformation to ensure that health systems are fit for purpose. We unlock decision makers’ potential to deliver value for money in health. We broker insight and provide thought leadership in sustainable health financing. We empower countries to ensure that everyone can access the care they need, whenever they need it, wherever they are. We engage the global health community. We build bridges. We design and unfold unique products and services for health stewards. We garner a wealth of competences spanning multiple disciplines. We stand by policy and decision makers the world over to walk the road to UHC. The P4H digital platform is designed to enable our members to connect and joint efforts. The platform is your hub. It is your dashboard. It provides unparalleled network space, interactive access to knowledge and case studies, tools for improving project and activity management - and the possibility to get involved on both global and local levels. Thanks to the vibrant communities in health, social protection and public finance, we have always been able to move forward. With your continued support, expertise and commitment we will succeed in an area where people around the world expect and deserve change. Let us make UHC a reality. We share a vision, we have the tools and we are ready.